Best 'Yard' Shoes on the market! Amazing work shoes! I purchased these shoes almost 1 month ago and have worn them everyday! From mowing, irrigation work, dewy mornings, standing on ladders, pressure washing, and hardscaping, these shoes have held up! Dry feet, comfortable all day long! Will buy another pair if these ever get worn down. Very comfortable. Walked over 20 miles through Washington DC while raining and my feet felt very comfortable and remained very dry. Would highly highly recommend these shoes. These shoes are incredibly difficult to put on. So difficult in fact that the loop at the back of the shoe tore off when trying to wrestle the shoe on. Once on, they are comfortable and function as designed but rather difficult to take off. I will be returning these for a full refund. So far they are a great shoes.. They are holding up very well and comfortable. Well but again. My Father in law is in Awe! Make more videos and commercials so I can share them! Amazing product. Perfect bday present for him. I looked like a hero! They don't keep my feet dry at all. Quite the opposite actually. The first time I wore them my feet were very wet, but I thought it was a fluke since the marketing on IG is all about keeping your feet dry. So I tried them for a second time in wet grass and after about an hour my feet were so wet you could hear them squishing with every step. It was as if I jumped in a pool. My skin was sore and my socks could be wrung out they were so wet. If Kujo Customer Service would like to see the video I made showing how wet my feet were, contact me and I can send it. I made the video for a friend to warn him. I am disappointed because I bought them for this reason. Now they are basically like any other yard shoe I have had, but more expensive. I just expect to have soaked feet when I wear them now. The ring tab on the right shoe also ripped off the second time I wore them. I am going to have to search again for a shoe that keeps my feet dry for early morning yard work. 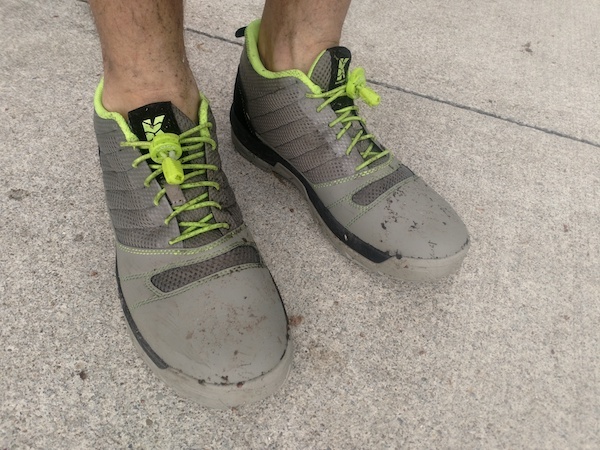 Aside from my feet feeling like a swamp, they are comfortable and robust and appear as if they will hold up. If Kujo can make a change that keeps your feet dry, these could be awesome yard shoes. Needing a pair of shoes to wear in the yard and seeing the Lawn Care Nut wearing a pair of these, I decided to give a pair a try. Out of the box, they were annoyingly difficult to put on due to the high narrow throat (which is nice once they're on) and the lace fabric binding in the plastic eyelets. This forces you to loosen the laces beyond where I'm comfortable with to get them on and off. A pair of Lock Laces solved this issue for me, and now they go on using a shoe horn and slip off by hand without fidgeting with the laces if I don't want to. Aside from that, they are comfortable to wear, seem very durable and are keeping my wheels at a very comfortable temperature, with or without socks. That they are waterproof is a real plus! Being able to run the power washer without throwing on a pair of boots and having dry feet throughout is wonderful! Solid protection from "just a rubber shoe"
These shoes are stylish and durable. These shoes are super comfortable. They are lightweight and can be worn all day without making your feet hurt. Great Fit, and although spring has just sprung in SE Michigan, these shoes have already got my feet excited for the outdoors! Not sure if 2 pair of shoelaces are needed. The kujo shoes are comfortable and have a good feel to them. Their looks are classy not flashy, so much so that wearing them to church is an option! My wife and I wore our new Kujo’s doing some yard work. They are very comfortable and durable! Very impressed! Great shoes but difficult to put on....might try a wider width. However, on days that I take the time to unlace them all the way and wiggle into them, their comfort lasts all day - and I have yet to slip in the greenhouse!